The idea that “poison is a woman’s weapon” is an old, made-up sawhorse. The concept has been invoked in works like Game of Thrones and Sherlock Holmes (not the Cumberbatch version, you didn’t miss anything), and bolstered by popular fiction: the terrifying grandmother from Flowers in the Attic, the adorable little old ladies from Arsenic and Old Lace, very nearly Marie from Breaking Bad, and the evil queen/gnarled old witch from Snow White. It’s a classic conceit: the femme fatale slipping a mickey into a glass of rye, the psychotic nana sprinkling arsenic on her grandchildren’s donuts, the jealous older woman offing her young competitionr, the cherubic nurse who is secretly an angel of death. But as Deborah Blum, author of The Poisoner’s Handbook, points out: 60.5% of poisoners are dudes, leaving only 39.5% of poisonings to the ladies. Still, compared to other methods for murder, 39.5% of poisoners being female is fairly high — from 2006 to 2010, women represented 21% of arson cases, and only 7.9% of gun murders. There are still many more female arsonists and shooters because those are more popular crimes — in the sample years there were only 49 poisonings total — but it’s still notable. Basically, if someone was poisoned, it’s not particularly likely that the murder was committed by a woman — but if a woman murders someone, it’s somewhat likely it was by poison. The myth persists, in part, because it makes so much sense. 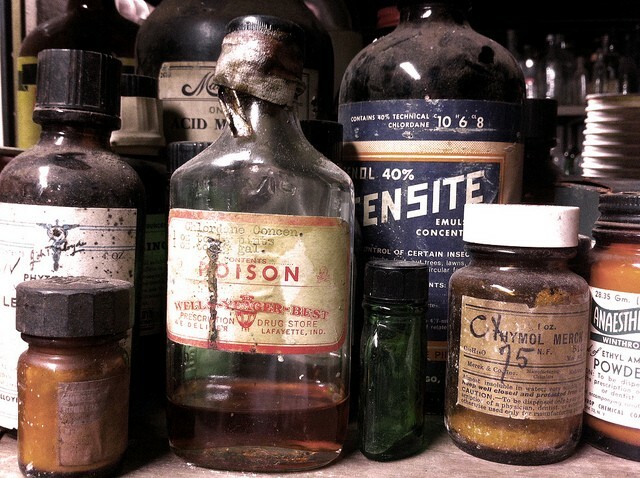 Poison is uniquely available to and administerable by women. Ladies have long been tasked with cooking, cleaning, and nursing, and poison can be drizzled into coffee, applied to the inside of freshly laundered shirts, or administered as an “accidental” overdose. As a recent Vice article showed, even grandmothers can do it; in Japan, a woman is accused of collecting about $8 million from poisoning six boyfriends and one husband. Poison is a hands-off, elegant means to someone’s end; it’s not showy or vainglorious, like stabbing or shooting. It doesn’t require muscle like, say, beating a human to death. Poison is a weapon for people who just need a job done. It’s very practical that way — practical and cold-blooded. So who were some of the heartless, real life ladies who have helped cement this idea in the popular imagination? When people think “female poisoner,” they often think of Lucrezia Borgia of the Showtime Borgias. This reputation persists, despite the fact that many of the rumors surrounding her are up for debate. But those rumors! The beautiful Italian scion was said to have had incestuous relations with her father (the Pope!) and brother, rumored to have been pregnant while getting an annulment for an unconsummated marriage, whispered to have had an affair with her third husband’s brother-in-law that ended when the man contracted syphilis. But best of all, Lucrezia Borgia was said to have a hollow ring that she used to poison drinks. Practical, fashionable, and deadly! However, these whispers have been disputed by historians, as the evidence in favor of her black widowhood is deeply suspect. A lot of poking around about who, exactly, Borgia was supposed to killed with her accessories results in the consensus that it was definitely “enemies.” The kind of poison she used is also up for grabs — some say white arsenic, others foxglove, others still La Cantarella (which, okay, is a type of arsenic). In Lucrezia Borgia: Life, Love, and Death in Renaissance Italy, Sarah Bradford argues that Lucrezia never killed anyone. Instead, Bradford and other scholars believe that Borgia was a crafty, pious art lover whose reputation was ruined by her families’ enemies — presumably the ones she didn’t manage to poison. However, according to Clara Alfano, curator of “The Borgias, the Art of Power,” a 2002 Roman exhibit examining the family: “[Lucrezia] did kill with a sword.” Phew. England hung Mary Ann for Charles in 1873, but he was far from her only victim. While never charged with their deaths, she lost scores of people to “stomach fevers,” including three husbands, a boyfriend, a dozen children and her own mother. After each of these deaths, Mary Cotton collected enough insurance money to float her, until her next husband or baby. Mary Ann started small, as it were, killing her own defenseless children, but when she killed her first husband, William Mowbray, in 1865, she was able to collect a pension of 35 pounds — a relative fortune. Then she was off to the races, killing for profit and not merely convenience. Her third husband, James Robinson, managed to escape her poisons, but not her grasp. He first hired her as a housekeeper, but after his baby daughter died of those pesky stomach fevers (which were probably going around, since at that point, Mary had lost eight of her own children to them), Robinson turned to Mary for comfort. They got so comfortable that Mary became pregnant…with a baby who later died of stomach fevers, along with two more of her half-siblings. Robinson, uncomfortable with Mary’s badgering him to change his insurance policies and suspicious about, you know, all the death, kicked her out. But never one to let circumstances stand in her way, she went on to kill at least five more people, including a bigamous husband and some more stepkids. Nannie Doss never got her own nursery rhyme, but she was the recipient of some rad nicknames: The Giggling Granny, The Jolly Black Widow, The Lonely Hearts Killer. Between 1927 and 1954, Nannie Doss killed somewhere between eight and eleven people all across the heartland, starting out in her home state of Alabama but moving on to kill in North Carolina, Kansas, and Oklahoma. A die-hard romantic, Nannie was obsessed by the love stories in her mother’s magazines, and at 16 she married her first husband, Charley Braggs. In 1927, after two of their four daughters died of “food poisoning,” he took their eldest child and fled, claiming to fear her. Soon after, Braggs’ controlling mother mysteriously died. After their divorce, Nannie married — and was widowed — four more times. Nannie found her husbands in the “Lonely Hearts” columns — old timey personal ads and another romantic obsession of Nannie’s. She was not entirely unlike the Craigslist killer in this regard. After her second husband raped her, she put rat poison in his whiskey. But while Nannie would kill with whatever was available — she once hatpinned a newborn grandchild’s skull — her favored method was to feed her victims prunes sprinkled with rat poison. She was finally caught in 1954 when she frantically stuffed her fifth husband, Samuel Doss, full of arsenic. That same day, he had been discharged from the hospital with a stomach tract infection — but Nannie wanted to collect the two insurance policies she had out on him, and a slow deterioration just wouldn’t do. Doss’s doctor was surprised by his sudden death and ordered an autopsy, which showed that the dead man was maxed out on poison. As they say, slow and steady poisons the race. When Nannie was finally caught, she laughed and laughed, cementing her reputation as The Giggling Granny. The room had a nauseating odor because the sick man had suffered an attack of diarrhea in his bed. The arms and legs of the sweaty and chalk-faced man thrashed around and he made incoherent moaning noises. From time to time, he screamed. Barfield murdered six people between 1971 and 1978, including Taylor, a handful of elderly people in her care, both of her husbands (one by arson! ), and her own mother. She suffered a great deal, but mostly by her own doing. Not one but two her her homes burned down, her loved ones died in droves, and her devoted son joined the military during the Vietnam War. Velma’s side hustle was forgery, for fun and profit, so after Taylor’s death, the police picked her up for passing bad checks and then surprised her with the accusations about the murder. Velma confessed that she had only intended to make her boyfriend sick, and then proceeded to confess to more and more murders. Not one to limit herself, Velma admitted to causing her first husband’s death through arson. It stands to reason that her second house fire — the one that forced her to move back in with her parents and led to her eventual murder of her mother, Lillie — had been set by Velma as well. After being charged with Taylor’s death, Velma’s defense argued that she never meant to kill him, only to keep him sick while covering up the fact that she had stolen money from him. This admission, as starkly guilty as it is seems, was intended to help Velma avoid the death penalty. It failed, and in 1984, Velma became the first woman put to death by the state of North Carolina since the death penalty had been reinstated in 1976. Before her death, she re-re-re-discovered Christ (she had always been a church-goer, but claimed that before prison she had been faking it) with the help of Billy Graham, came to council other prisoners — who, in return, called her Mama Margie, her real first name — and wrote her memoirs, Woman on Death Row. Barfield chose Cheez Doodles and Coke for her last meal, and wore pajamas, a robe, and an adult diaper to her lethal injection. Meredith Haggerty is a writer and editor in Brooklyn.